Fr. Roger will offer a presentation to parents and children in preparation for First Reconciliation. Please finish working through the purple “We Prepare for Reconciliation” book before this meeting. Celebration of First Reconciliation –We will have two priests available at each celebration. Please gather in the Church and we will begin with Mass. Thank you for your support of the Giving Tree program that allowed the Parish to help families at Christmas. Once again Parishioners were very generous and we were able to help 105 adults and 111 dependents in our community. A value of $19,619 were collected in gift cards. St. Dominic’s elementary school donated $2500.00 in gift cards in addition to helping families in their school. They also did a food collection for our pantry. St. Paul Secondary School took on seven families and provided food and gift cards as well as the other families they supported within the school. It is wonderful to see the family/school/parish support that we can achieve in this community. Thank you to the teachers, principals: Julie Tollis and Jim Horvath and Chaplain, Jim Mc Levey. The recipients were truly touched by your generosity. They included single parents who did not know how they were going to find the extra funds; families dealing with crippling illnesses that takes all their money and resources; people who have lost their jobs; families who have lost their parents; new Canadians; and people who cannot make ends meet on their meager incomes. Thank you for your support of community outreach. Each food gift card, $5.00 coffee card and card to buy toys or gifts makes a huge difference. When we all work together, we can accomplish much in Christ’s name. Did you know that your weekly offering to St. Dominic's can be automatically paid from your bank account or charged to your credit card? With the Pre-Authorized Giving Plan (PAG), you can make regular donations to support our parish through the convenience of automatic debit or credit transactions. Tax receipts are automatically generated for any donations you make through PAG. 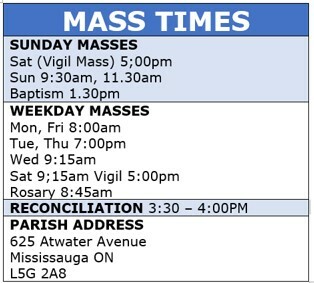 To register, please pick up a PAG brochure in front of the parish office, or visit https://community.archtoronto.org to set up your recurring offering. Thank you for your continued support of St. Dominic's Parish! · If you have not picked up your offertory envelopes, please do so at your earliest convenience. They are in the vestibule. If you have moved and not informed the office, please let us know so we could update your information in our system.